Seasonal Gifts are only around for a short time, and are for sending as gifts to your friends. You can send them to any friend you think would like one, whether they already have a Fairyland Garden or not. These gifts are for sending only, so you can't "buy" one for yourself - you'll need to be sent one by a friend. So if you still need one for your own Garden, you could send one to a couple of friends and ask them if they would kindly send one back in return! If you wish to send yourself a Seasonal plant, see the Self Gifts page. The Sunflower is available from late June and it brings the beautiful sun in your garden when it's ready for harvest! You can also get an eclipse with the help of Luna Serena - check the Magical Pots page for this. see the Fairyland News for more info. It attracts the cute Summer Mice and Mallards when fully grown! 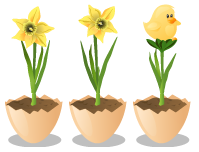 Send beautiful Daffodils to your friends, so they can attract the Easter Bunny! Upon successfully growing this plant and harvesting its fruit, an additional 1 sq ft of rainforest will be protected. 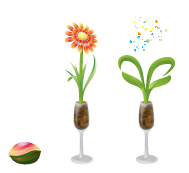 Support Earth Hour 2014 by sending limited edition Earth Flowers to your friends! 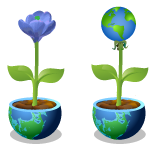 Share Earth Flowers with friends, so they can do it too! Harvest Message Congratulations - you and your Fairy have successfully harvested a Bouquet of Flowers. Another 10 square feet of rainforest have also been adopted by this Garden! It's the time of year for growing a Shamrock in a Leprechaun's hat! Will you be lucky enough to grow a 4-leaved one? There's a 1 in 10 chance that your gift will grow into a lucky 4-leaved one... and there may be other surprises too! And will the Leprechaun be wanting his hat back, we wonder?! The 4-leaved Shamrocks give you small shamrocks on the ground, but only when fully grown. 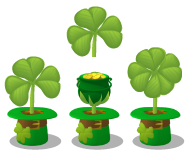 If you harvest the 3-leaved Shamrock, you'll receive 5 gold and when you harvest the 4-leaved one, it will give you 25 gold. But don't harvest the 4-leaved Shamrock yet because it will bring you a lovely Rainbow in your garden! See more info on the Backgrounds page. Between 6th and 14th February, all newly created Fairyland Gardens will automatically receive a Valentine Rose. So to begin with, brand new Gardens will be the only ones capable of attracting Cupid Mouse. 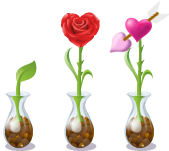 To get a Valentine Rose for your own Garden, you need to spot a Cupid Mouse in someone else's Garden, while at the same time ensuring that you have an empty "Glass Vase" in your own Garden (this is the pot which comes free with the Loveflower gift). Upon successfully growing this plant and harvesting its fruit, an additional 2 sq ft of rainforest will be protected. It flowers after just 1 day, when it will begin to attract Lovebirds to your Garden! It can be harvested after 4 days. Another 1 square feet of rainforest have also been adopted by this Garden! 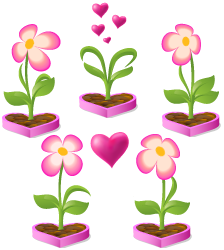 You'll get these animations for a week, if you (or a friend) sprinkle the RFH Loveflower with Star Dust. 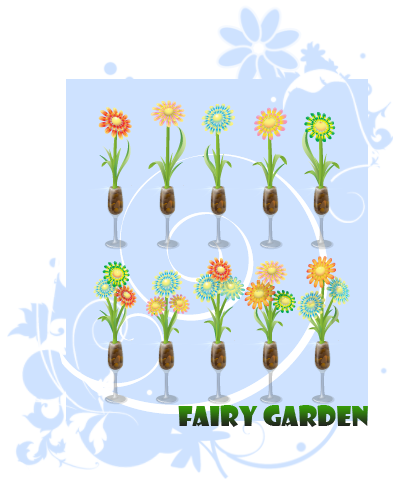 Celebrate the New Year in Fairyland by sending your friends this special New Year Flower! It will be ready for harvest in time for the new year, revealing its surprise! Harvest message: Congratulations - you and your fairy have successfully harvested a Festive Firework! Seasonal Challenge: Build A Snowman! Your snowman starts out as 3 simple snowballs. Your challenge is to hunt for the items needed to finish decorating him - some arms, a hat, some eyes, a mouth, a nose and some buttons... then discover what happens when he's all finished! What happens is that the funny Snowmen attract cute Polar Bears once they are completed. Here's a screenshot when you find an item. You'll find al the info you need about it on Maryjane's thread from the Fairyland Forums. She updates the info as soon as she finds out something about it so be sure to check the last pages of the thread. When the Christmas Tree will reach the fully grown stage, it will bring snow to your garden which attracts the following animals: Arctic Fox, Arctic Hare, Snowy Owl and Reindeer. When it snows, festive common wildlife will also visit. Rudolf will come to your garden too when the tree is decorated with beautiful lights (ready for harvest). 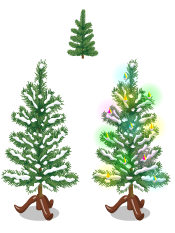 Tip: Use one Sprinkle of Star Dust on your ready for harvest Christmas Tree to make the lights flash for a week and receive visits from Santa! Upon successfully growing this plant and harvesting its fruit, an additional 10 sq ft of rainforest will be protected. Brrrr! The Ice Flower is guaranteed to bring many wintry surprises to any Garden in which it is planted! The snow will attract the following animals: Arctic Fox, Arctic Hare, Snowy Owl and Reindeer. 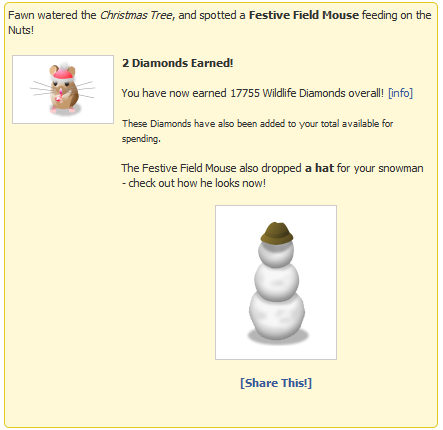 Festive common creatures will also visit your garden if it's snowing, which will only happen in the first 24 hours after the it flowers. 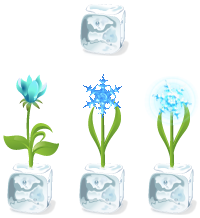 Tip: Use one Sprinkle of Star Dust on your Ice flower to bring pine trees in your garden and make it snow for a week! Send your friends a seasonal Poinsettia to grow in their Gardens! It will flower after 2 days, attracting Cardinal birds and Robins to the Garden. It can then be harvested after 7 days, releasing a small gift! Fruit Seasonal Gift. The gift with the pink ribbon gives you 5 gold and the one with the gold ribbon gives you 10 gold! Send your friends a Poppy to grow in their Gardens! The Poppy will be fully grown after 2 days, and ready for harvest after a further 2 days, when it will attract beautiful Peace Doves! If you sprinkle it with Star Dust, you'll gain a special background for a week (Peace Doves flying in your garden). For a very spooky surprise! Once the plant reaches the ready for harvest stage, the sky will turn to black and witches will fly in your garden, but only for three days. If you want to bring them back (along with the ghostly wildlife) for another week, just sprinkle Star Dust on the 'Ready For Harvest' Halloween Plant. Also, when the plant is ready for harvest, the pumpkin pots will gain lots of funny Halloween faces and it will remain so until you harvest it. Black Cats and Bats will be attracted by it's flower or fruit and spooky ghosts will be attracted only when witches are present. The Pink Ribbon Plant is available to help raise Breast Cancer Awareness throughout October. In the flower stage, this pretty plant will turn your garden's sky to pink and the Flamingo, the Pink Elephant and the Pink Panther will come visit! Harvest message Congratulations - you and your fairy have successfully harvested a Pink Ribbon, which has been helping to raise breast cancer awareness throughout Fairyland in support of Breast Cancer Awareness Month.